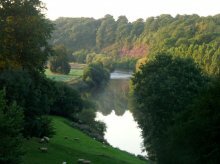 Moccas Court is unique, offering the personal touch of a private family home with the comfort of 5 star Country House - a tranquil retreat from the busy world outside- perched high above terraced banks over the River Wye. No spa, gym or guests internet access. You may even have to stand in the drive to get mobile phone reception. The surroundings amply overcompensate, a genuine haven for countryside and wildlife lovers and the physically active. The history and the setting are matched by a warm welcome and a friendly, deliberately informal atmosphere. Moccas is ideal for a memorable and relaxing break for couples or exclusively booked for your family houseparty. The spectacular bedrooms are all decorated to the highest standard and provided with top-quality ensuite facilities. Furnishings are restrained, echoing the period and style of the house. The rooms all have beautiful views over the grounds and the surrounding countryside. Pre-dinner drinks will be offered by the owners, Ben and Mimi Chester-Master, at 7.30pm in the elegant Library. Dinner itself will be served in the Round Room, designed by Robert Adam and clad in exquisite hand-painted wallpaper, lit by soft candlelight. Unless guests request to dine separately, they are invited to join a convivial atmosphere around the large mahogany dining table. The Round Room has the unerring ability to create an instant bond between guests, where delicious food and extraordinary surroundings leave a lasting impression. Situated as it is in an area of extraordinary natural beauty, and so close to the Brecon Beacons National Park, guests will never be short of things to do. Equally, Moccas is a great place to relax and unwind for those that are feeling less energetic. Nowhere is more conducive to a rewarding stay and a good night's sleep. We hope you will find your visit as memorable as all those who have stayed here in the past, from 1785 through to the present day, but especially since Moccas Court became what it is today.